"Loxton is a great place for young families." Very diverse, very good facilities. Medical, Sporting, Schools, good shopping with loads of fresh produce. Other major towns close by, provide even more choices. "Best place in the world for retirees"
Great climate, great clubs, all facilities, golf courses, boating, fishing, you name it, it's here. Wouldn't live anywhere else. 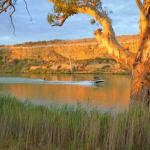 "Great town on the Mighty Murray River"